BlackBerry diehards looking forward to purchasing the company’s new keyboard-equipped Q10 handset around its promised launch window of April may have to wait a month or two longer if they live in the U.S.
That’s the latest from BlackBerry CEO Thorsten Heins, who tells the Associated Press that the Q10 isn’t likely to ship in the States until eight to 10 weeks after its touchscreen-only sibling, the Z10, arrives at market. 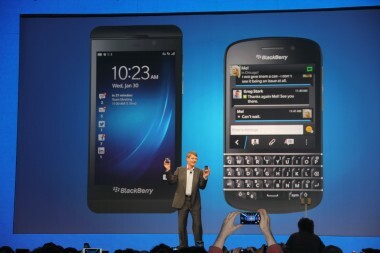 Currently, the Z10 is expected to make its U.S. debut sometime in mid-March. Eight to 10 weeks after that puts us in May or even June, which means the Q10 might not ship in the States until late-spring/early summer. I asked BlackBerry to confirm that release window, but a company spokesperson declined to do so. It’s clear, then, that the Q10’s stateside release date is something of a moving target. Not that there’s much to be done about it. Wireless carriers like AT&T and Verizon have extensive testing protocols for new devices that often take months to complete. When a new operating system must be vetted as well, that process becomes even more involved. BlackBerry might have been able to avoid the delay it’s suffering now if it had delivered the Z10 and Q10 to U.S. carriers earlier than it did. But it didn’t, and now there’s little to be done to expedite the testing process. An unfortunate situation for BlackBerry, given the string of delays that put BlackBerry 10’s delivery more than a year behind schedule.